When it comes to my accessories, I'm a stickler. I'm so passionate about them when it comes to having that weighty feel and being something that you can wear with a number of outfits and that it's a classic that finds its way into your look year after year. Although I believe in this, I also feel that pieces should have a bit of flash as they are not meant to be stuck in time. As an Accessories Stylist and the Editor in Chief of Kitten Lounge, this is essential whether I am working on my Editorial Calendar, on a client, project or doing an appearance. I love being introduced to new designers and then bringing it to my readers whether it's online, here in NYC or wherever I am at the moment. Holiday of last year, a new designer emerged that I became excited about instantly – Cynthia Rybakoff. I was drawn to her use of natural stones and that they were done in a way that had a personality all their own while being something that you could wear with other pieces and for years to come! Her Agate Necklaces – Dear Heart Pendants have vibrant colors and although I have yet to go to her studio, I'm excited to see her creations in person as I'm sure that pictures don't do them justice. I love that her pieces have that chunky vibe while also being very feminine and approachable. You can see her pieces here and <"http://supermarkethq.com/designer/11852/products" target="new">here! I love these charms. I know, I know, this is the second time in a month that I've blogged about charms, and I'm really not a charm person. But there's something about theseâ€¦ They're very tasteful, classicâ€¦ A lot like my cat's collar tag, actually. But nicer. They are, without a doubt, overpriced. It's the charm with the tiny gold heart that brings me back to the site again and again. It reminds me of the kind of thing we'd make in high school when we made jewelry in our shop class. If you missed out on this experience, you probably wonder why jewelry is so terrifically expensive. If, like me, you tried to recreate the neighbor's wedding ring, you would know how desperately hard it is to get metal to do what you want it to. So kudos to Heather Moore for landing her collection at Neiman Marcus. And for patiently printing our names in courier font around a tiny gold heart. That sort of thing takes patience. The sort of patience that can only be bought for $700. I admit that I've been known to shop as early as 8 AM. It's hard to resist when you can be in the comfort of your own home drinking coffee, ignoring the emails that have multiplied in your inbox overnight. I was admiring this pretty shell necklace, idly listening to NPR's Morning Edition when I heard this amazing story about Neanderthals. Scientists in Spain have found evidence of "body ornaments and cosmetics," owned by Neanderthals, according to Christopher Joyce for National Public Radio. To put this in plain English – 50,000 years ago, Neanderthals wore jewelry. "Neanderthals were our evolutionary cousins, but they'd sure stand out in a modern crowd," writes Joyce. "With heavy brows and jutting jaws, they were a rough-looking lot. But archaeologist Joao Zilhao of the University of Bristol in England says he's found evidence at a Spanish excavation that might change that view. He's found shells with holes in them, apparently strung together and worn like beads." "Ornaments show you're part of the in-crowd, or a big shot," writes Joyce. After having a good laugh about that (I guess status jewelry existed before us, Homo sapiens) I checked out NPR's website. Am I shallow? Unevolved? Obsessed with status? I made a note to contemplate all thisâ€¦ after 9 am, or perhaps tomorrow. In the meantime, I bought the necklace. The best thing about these little beauties is that you don't have to be a jewelry designer to make a gorgeous necklace for yourself. You just buy the pendant, run a cord or chain through the holes that run through the top of the pendant, and voila! You have a necklace that will be the envy of your friends and coworkers. These pendants are very affordable, and the colors are breathtaking. Each pendant varies slightly in color and size. Measurements: 11 x 21 mm. Hole runs through top edge of rectangle. 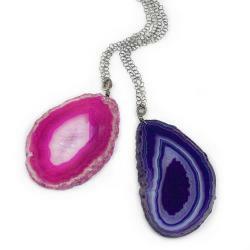 These stunning pendants are individually made and each pendant varies slightly in color. Hole runs through wide edge of triangle and measures approx 2mm diameter. Hole measures approx 2mm diameter. The brilliant optical properties of dichroic glass are the result of multiple micro-thin layers of metal oxides. NASA developed dichroic glass for use in face shields in space suits. Layers of different metals – gold, silver, titanium, chromium, aluminum, zirconium, magnesium, silicon – are applied to the surface of the glass. The glass is then kiln-fired at extreme temperatures in a vacuum. The resulting plate of dichroic glass can then be fused with other glass in multiple firings. Certain wavelengths of light will either pass through or be reflected, causing an array of color to be visible. Due to variations in the firing process, individual results can never be exactly reproduced. Each piece of fused dichroic glass is unique, and no two pieces can ever be the same. The classic pendant is an ultra simple look that works well with spring's more detailed, flamboyant clothing. 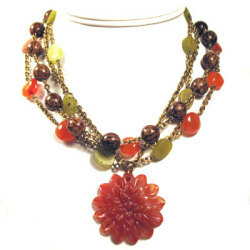 A pendant should complement, but not clash with, the strong colors and patterns of spring and summer fashions. Traditional gemstones and simple settings work best for this style, though design and color should not be overlooked. Simple and elegant best describe what I consider a classic pendant. Jewelry takes on a more traditional look for spring 2008 with the reappearance of the classic heart motif worn as a simple pendant. Although this look is always strong around Valentine's Day, its popularity will continue throughout the spring and summer. An incomplete heart-shaped piece of Orange Mother of Pearl hangs sideways from a 14k White Gold bail. Diamond-studded White Gold completes the shape of the heart and adds extra shine. 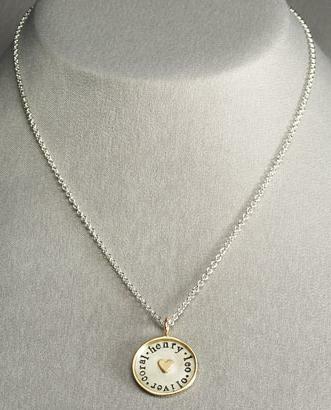 Signifying love everlasting, this pendant features two hearts joined in an infinite loop. A line of alternating round diamonds and deep blue sapphires adds fire and color to the design. The pendant is suspended from a delicate 18k white gold cable chain. 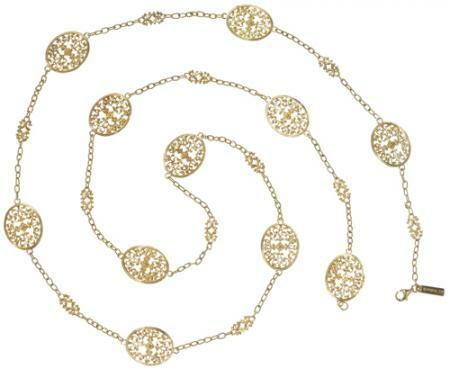 You may have seen Kathleen Lynagh's jewelry company also referred to as KL Jewelry Designs. Whatever you want to call it, she's got lots of wonderful necklace, which includes a collection for the bride along with plenty of designs us old been there post brides can still wear. Pictured above is a double strand pink pearl necklace with a sterling leaf clasp. It is chocker length, so great to wear with something off the shoulder when you are ready to show a little skin. Here's another choker, combining pearls set in in sterling swirls that resemble leaves and branches. And finally, this is an adjustable pearl and gemstone necklace, though it looks like it could be worn choker length with no problem.